You’ve worked hard to grow your business. Orders are coming in at a higher volume, consistently so. Despite your best efforts, you’re spending an ever-increasing amount of time manually fulfilling orders. Without warehouse space and personnel to help, you’ll likely spend even more time focusing on the logistics of shipping products to your customers in a timely manner. When you begin to feel as though your company has morphed into a shipping company, it’s likely time to consider moving your products to a fulfillment center. 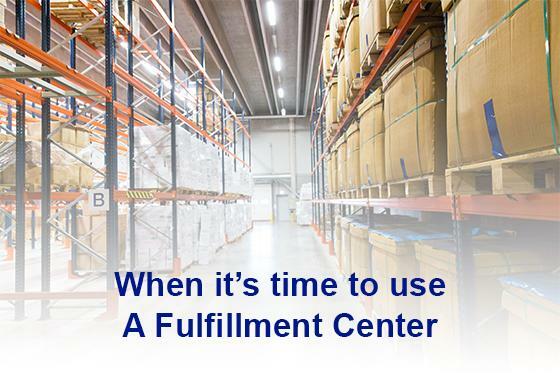 In addition to saving you precious time, fulfillment centers offer other advantages as well. They can save you money on shipping costs due to their aggregated volume as well. Faster shipping times play an integral role in determining whether or not customers decide to purchase your products. According to a recent study by Dropoff, 97% of customers find expedited shipping to be an important consideration for online shopping. Moving all your inventory from your garage or spare bedroom to an organized, efficient warehouse will not only get you back your personal space, but a professional fulfillment center will store your material securely in bins or on shelves, organizing them for quick retrieval for order shipping; and consider the decreased traffic and anxiety from not having to get that last package prepared before your regularly scheduled carrier pickup! While there are a number of benefits to be gained from working with a fulfillment center, there are a few things to consider before you decide to move forward. Fulfillment centers typically charge what is referred to as pick and pack fees. You could also be charged storage fees as well. Therefore, before you make the transition to a fulfillment center, it is important to understand all the costs involved and weigh the pros against the cons. At Federal Direct, whether you are an established organization looking for a reliable and service-oriented fulfillment partner, or a growing business looking for a more efficient and effective way to get your product delivered, we’re here to help. Our team of fulfillment experts can assist you every step of the way. Contact us today for a quote!